Image courtesy of NASA Orbital Debris Program Office A computer-generated image depicts objects in the Earth’s orbit that currently are tracked. 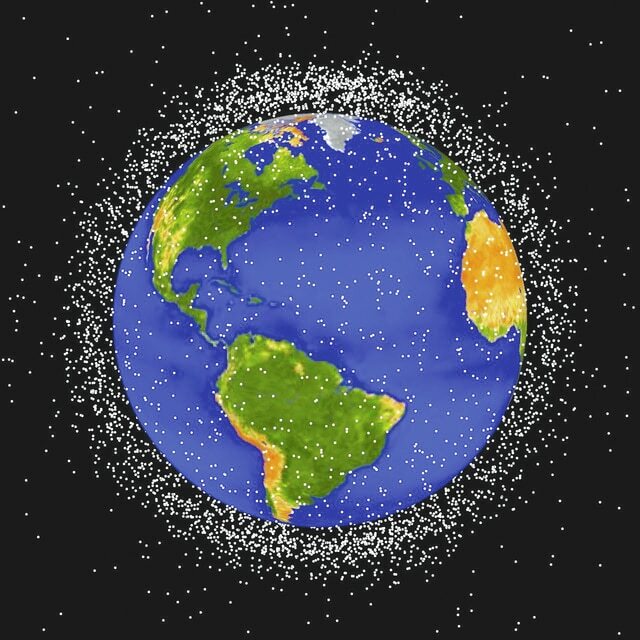 Approximately 95 percent of the objects are orbital debris. WRIGHT-PATTERSON AIR FORCE BASE – When it comes to space, dozens of countries now have satellites circling the globe, which requires an eye on the skies due to the dangers posed by falling space debris. Since the launch of Sputnik in 1957, over 39,000 man-made objects have been catalogued and many of these have already come down. The space surveillance mission falls to the U. S. Strategic Command Joint Functional Component Command for Space (JFCC Space). Through its Joint Space Operations Center (JSpOC), it detects, tracks and identifies all artificial objects in Earth’s orbit. JSpOC tracks more than 16,000 objects currently orbiting the Earth. The United States and its allies rely on JSpOC to provide detection and early warning about threats posed by space debris. Accomplishing this mission requires referring to multiple data sources from separate systems, which introduces the possibility for errors. Air Force Space Command recognized the need for an innovative technology to support space situational awareness beyond the existing legacy toolsets and conveyed that need to the Air Force Research Laboratory. Working with the Air Force under a Small Business Innovation Research award, the Design Knowledge Company – a small business located in Fairborn, Ohio – developed a system to alleviate the danger posed by falling space debris. The JSpOC Mission System User Definable Operational Picture provides an Agile Work Environment (AWE) tailored to the space domain that combines data from different sources. These include legacy systems, emerging data sources, algorithms that operate on the data, and a variety of visualization, collaboration and work efficiency tools. The JMS User Definable Operational Picture integrates easily into Microsoft Office products and offers the ability to customize the interface. According to Paul Zetocha, the AFRL program manager, assembling an integrated, common operating picture from disparate data sources for the JFCC Space Joint Planning groups is crucial when responding to high-interest events. To date, the technology is operational as JMS at Vandenberg AFB, California, and as the Aircraft Repair Visualization and Integration Simulation Support supporting logistics at Warner Robins Air Logistics Complex at Robins AFB, Georgia. The key to VISTA’s approach is providing this at-a-glance visualization and comprehension support in a near real-time fashion. With this capability, space warfighters will be able to leverage VISTA to support tactical, as well as strategic, space situation awareness functions.